These awesome figures are the first wave in the exciting 2006 Saga Collection line and are based on the Battle of Carkoon. 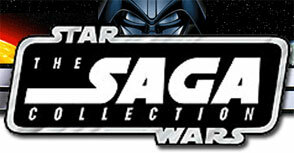 Each includes a base and a randomly-selected exclusive hologram figure in the exciting new Saga Collection package. Please Note that we receive BOTH English and Bi-Lingual Packages. The packaging will be different however the figures will remain the same. Be Advised that you will receive one type or the other.